And both the x and y at the same time. At one point I think InDesign only let you change one at a time. How about light-seconds﻿﻿ while we are at it? To me though, the most important measurement is the pint! Mind, thats an Imperial Pint. Why not simply make the input boxes within Affinity Publisher intelligent (like Quark XPress) so that the user can enter a number followed by "pt", "mm", "cm", "in", "ft" or "p" for pica -= that can't be too hard to implement and satisfies everybody. If nothing is added after the number then the default measurement system would be used. That's how they work currently. You can also use math expressions in the input fields. We simply don't support picas as unit at this point. That's sad @MEB. Not supporting picas will relegate AP to "toy" status in the USA. A blunder a serious as, for example, Microsoft failing to support CMYK which resulted in almost 0% market share in the pro market. AP will never gain any traction against Quark and InDesign in the US by ignoring the needs of professional designers. That a big market to give up by being stubborn over stuff that is easy to fix. Depends on where one clicks: on one ruler vs intersect of both rulers. I was replying to @ijmsmith specifically when I said he can define/use units in the inputs fields. The reference to picas was just to say it's not available as a unit currently. It doesn't mean the dev team won't consider it for future updates/improvements. 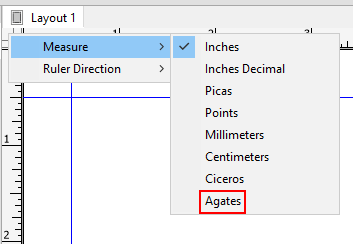 This works with Quark but currently it doesn't appear that you can use units of measurement that way in Publisher. This needs to be done as easily as Quark. If the unit is set to points, simply override the field with *12. But you cannot get pica output until a new beta. ANY custom unit is definable. How nice is that? May it serve as an example of how Publisher and the other Affinity products ought to solve the issue of missing unit types support. Why not make these unit types user definable in the first place? Problem solved. Simple and effective. Just think: we could have not only Affinity cats and Adobe pugs, but a veritable menagerie!! I always wanted to get a copy of Designer Pro X, but the price ($299) was a bit too much for me. I've been testing the waters in DPX, and it is a surprisingly powerful layout app. It has its own approach which I like (such as a combined page and layers panel, which is a novel idea), and as far as a illustration tool goes compared to Designer, it provides those tools which a lot of Designer users have been asking for (simple 3d tool, blend tool, contour tool), yet missing others. 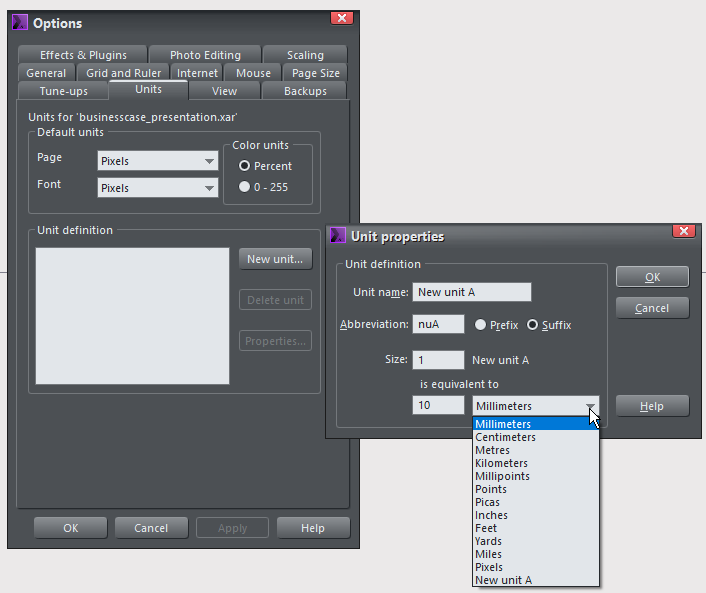 As a layout tool it has some very powerful features which are still missing in Publisher, yet many odd omissions as well. For example, web export is more than excellent: layouts can be exported as responsive websites, with pages exported separately as regular html/css/js pages, or as a super-single page site with parallax and animation effects. It has most of the essentials of a decent layout app, but curiously falls flat on its face in regards to basic stuff like a baseline grid, optical margin alignment, and a number of other things we have in both InDesign and even this first version of Publisher. And no master pages, it seems. Objects may be repeated over all pages instead. So not the InDesign alternative I was hoping for either. The 3d tool is the (by far!) simplest to use 3d tool I have ever used in a graphics design app. So simple, yet quite effective (yes, I am quite an experience 3d generalist, but sometimes you just want simple extruded shapes in an illustration or presentation). And just for that and the web export it's worth the $25 - no questions asked. Also, some of the live shapes are more usable than the ones in Designer. For example, the demo presentations include live graphs which are again super simple to adjust. Anyway, quite powerful companion tool. Fun to work with. Sigh. That's rather short-sighted. Simple solution that caters for all, and it is not even considered. Yes, perhaps their opinion has changed a bit or byte since at least 2.5 years! Perhaps we have to shout out much louder what is needed (not only for Serif). Hey @KipV. I agree. Picas are needed and it was the first thing that I noted. In the meanwhile, I know it's a pain, but you can work in points and that's a more apples-to-apples conversion until they get this straightened out. And if you put in measurements like "3p6", the app auto converts the measurement for you. Here to hoping for Picas in our future! Wow, I didn't know Publisher converted 3p6! Interesting, I haven't really been using Publisher much beyond the first week since I don't plan on it getting roughly where I want it to be in the near future. I might use it more in a year depending on much it advances. This discussion has me seriously worried about AP's success. I had assumed that AP was being created as a tool for the publishing industry. The basic units of measure in the publishing industry are the PostScript point and the PostScript pica. Those are fundamental units: the units that are used internally by all of the devices that convert our computerized designs into reality. It is the same throughout the world. If AP is using some other measurement system internally I worry that everything it produces will be just a tad off kilter. That would not be a good thing. When, where? Serif’s super cat shifted the time-space-structure? Again? All the programs for Affinity and Adobe do measurement conversion on the fly﻿. Well they do, but only for supported unit types (mm, inch, cm, pt, pix etc). Picas are not yet supported so typing in the form '3p6' is ignored (afaik). Once supported you would be able to type '15p' or 14p11 but only once it is a native unit type which it is not yet (afaik). Well they do, but only for native unit types. Picas are not yet supported so typing in the form '3p6' is ignored (afaik). Correct on earth in this time bubble.